The day before I left for this trip, I spent all day cooking, cleaning, doing laundry, things like that. I had taken the kids to the store last weekend and let them pick out easy foods like Lunchables, pizza rolls, frozen White Castle burgers. Basically my kids are going to be sad when I get home and we get back to our regular eating. But yeah, my husband’s sticking with Paleo while I’m gone and I wanted him to have lots of things that just need to be heated up. So I made this spaghetti squash casserole, this chili, and this beef stroganoff. All of those are favorites and I make them pretty much weekly. I also made some Paleo cornbread, a meatloaf you’ll see eventually, and roasted up a bunch of veggies. And finally, I made this. I love making recipes like this because the meat is totally Paleo, super flavorful, and perfect on top of mashed cauliflower. But then it’s even more delicious on a roll with melty cheese on top! Which is, of course, how I ate it because I am weirdly obsessed with sandwiches right now. Heat olive oil over medium-high heat. Sprinkle salt and pepper on all sides of the chuck roast. Brown the chuck roast in the olive oil on all sides. Transfer to crockpot. Pour beef broth, Peperoncinis and juice, Hot Cherry Peppers, and crushed tomatoes on top of the roast. Cook on low for 8 hours. If you have time, refrigerate for at least a couple hours to allow the fat to harden at the surface. Scrape that off and trash it. (If you don't have time, get rid of the fat that you can and proceed.) Use two forks to shred the meat and return it to the cooking liquid. Heat on the stovetop until hot. 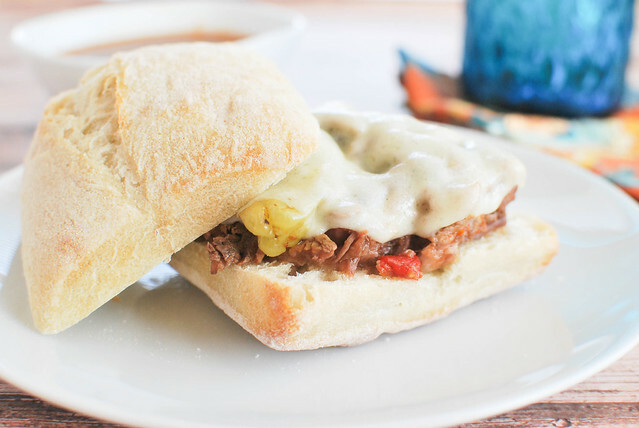 To serve, put a pile of meat on bottom of a roll, top with provolone cheese, and the top of the roll. Serve with a small bowl of the cooking liquid to dip. 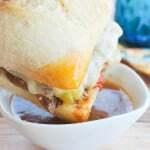 10 Responses to "Crockpot Spicy Italian Drip Beef Sandwiches"
Oh my goodness now that is some foodporn right there! Gotta make this ASAP! Oh my this looks amazing! What kind of roll did you use? It looks perfect! I would eat like 6 of these. no shame. I would love the spice from the Pepperoncinis and Hot Cherry Peppers. Isn’t it funny how we always try to prepare the house completely before leaving the family? I hope you enjoy your trip! And so funny we’re beef drip twins today! Can’t wait to try yours!! Looks amazing! 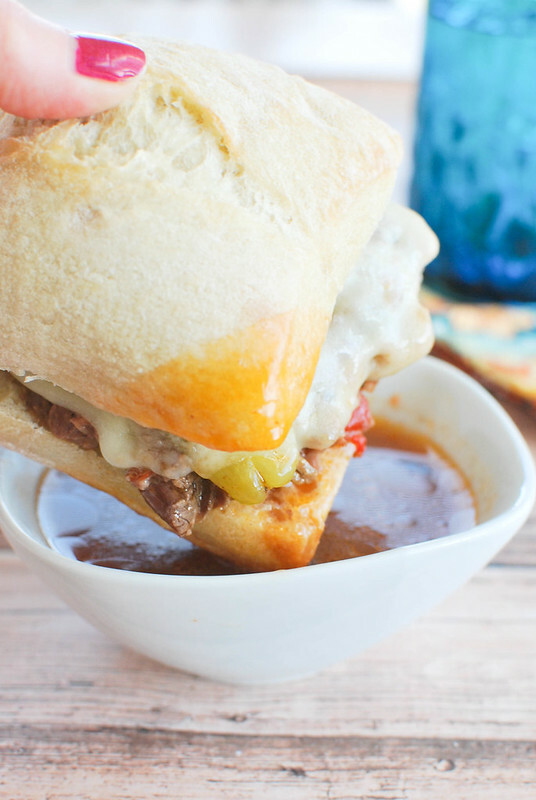 I love crockpot meals like this! These sandwiches look so delicious. I wish I had one right now in my hands. You’re such a good wife and mama! 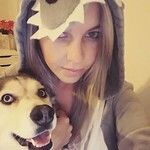 You are such a good wife / mommy! 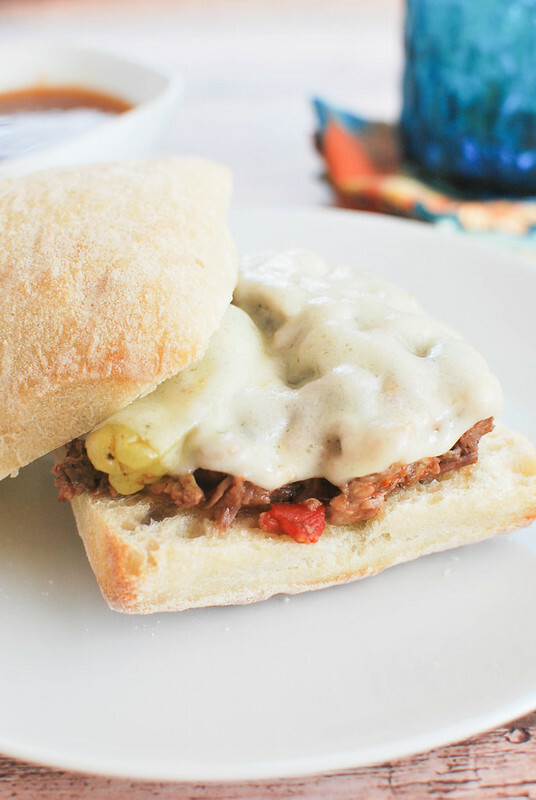 This sandwich looks incredible – I can see why you ate the whole thing!! I have to make this for my husband – he would love it!! Oh that looks delicious! What sort of roll is that? !